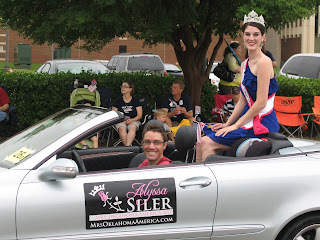 I was so thrilled, when I won Mrs. Oklahoma, to find out that The Paper Lion, in Edmond, was my stationery sponsor. I actually worked there four years ago for owner Bruce Maxwell and his daughter (and manager of the store), Camden Chitwood. I LOVE this store! 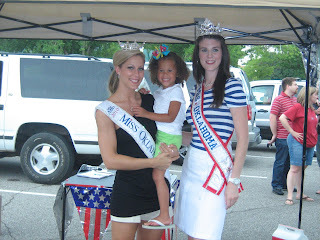 They just moved to a new and beautiful location and Camden asked me to come to the open house as Mrs. Oklahoma to greet people and sign autographs. I was more than happy to do so! Here are some pics of their beautiful new store. 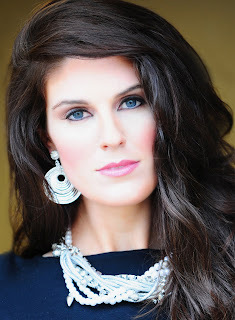 I wanted to take a minute to tell you about one of my sponsors and why you need to go visit them! Renaissance Salon and Spa is so graciously taking care of my nail care needs for the year of my reign! The salon/spa is in a beautiful renovated house with landscaping I want to yank out and plant at my own house! I have fallen in love with a product they use called Axium. A thick gel in any color (you can even do french manicures) is painted in layers on your nails. A light hardens them up and you are good to go! It makes your nails so strong so they are much less likely to break or tear. Since it can't be removed with nail polish remover, you could paint over it in a different color for one of two days, and then remove the new polish to find your Axium manicure still perfectly in-tact underneath. It is a wonderful product and I don't think many other salons use it. Renaissance also has a full-menu of other amazing salon services and spa treatments. I really hope you will go and check them out. If you do, be sure to tell Anthony that Mrs. Oklahoma sent you! P.S. For those of you who saw a story on the news about a lady having permant nerve damage from a gel manicure, this is NOT the same thing! Julia, who does my nails, never uses a drill on my nail bed (the lady on the news had her skin cut into by a drill) and you don't stick your whole finger down in any kind of powder. She paints the Axium gel on your nails just as she would nail polish. Just wanted to clear that up! Okay, I decided to lighten things up a bit with this post. I posted these pictures on my personal family blog over a year ago. I thought it would be funny to put them on a pageant blog, however, since we pageant girls are usually trying to look our best at all times. I think it's good to make fun of yourself every now and then! This is me on my first day of 5th grade... I showed this pic to my hairdresser, Brenton, and he said I looked like I was trying to be Debbie Gibson. This look does kinda scream "Electric Youth". I love the highwaisted, tapered pink pant. And it's always a good idea to tuck your shirt into your stretch pants, I think. My Fantastic Sams nightmare hair (no offense to Fantastic Sams. 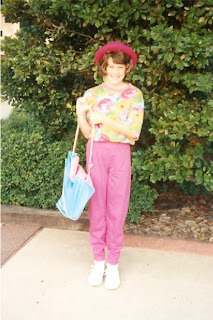 I'm sure the girl who butchered my hair in 1991 doesn't work there anymore) looks just adorable with my Blossom hat, doesn't it? That's about all I can say about this one. 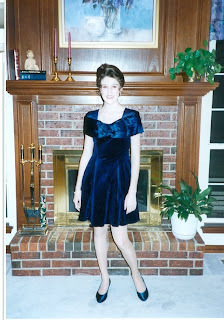 Next up, my 8th grade Valentine's dance... Ok, I know I'm pasty white now but SERIOUSLY! I have to say, no updo is complete without a pair of matching tendrils in front, and to show up at the dance without dyed to match shoes?....well, that would just be embarrasing. I saved the best for last... There's nothing like a thirteen-year-old trying to look forty. Now that I'm in my (extremely)late twenties I can't really see the appeal in that. I was so in love with this picture at the time. 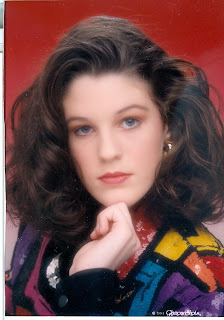 I'm fairly certain that, had they let me leave Glamour Shots with it, I would have worn that extremely stylish sequin jacket to school -because that's how cool I was. Except that I totally wasn't. Looking at these pictures I'm starting to understand why. The current me (well, the current me after someone has blown-out and fluffed up my hair and a professional has done my makeup. I don't go to the grocery store looking anything like that, people.) Is the fact that I can totally see similarities between the two a bad thing!?! I love living in Edmond, Oklahoma. Even though it is rapidly becoming a pretty large town, it still has many events and activities that make it seem to have a small town charm. 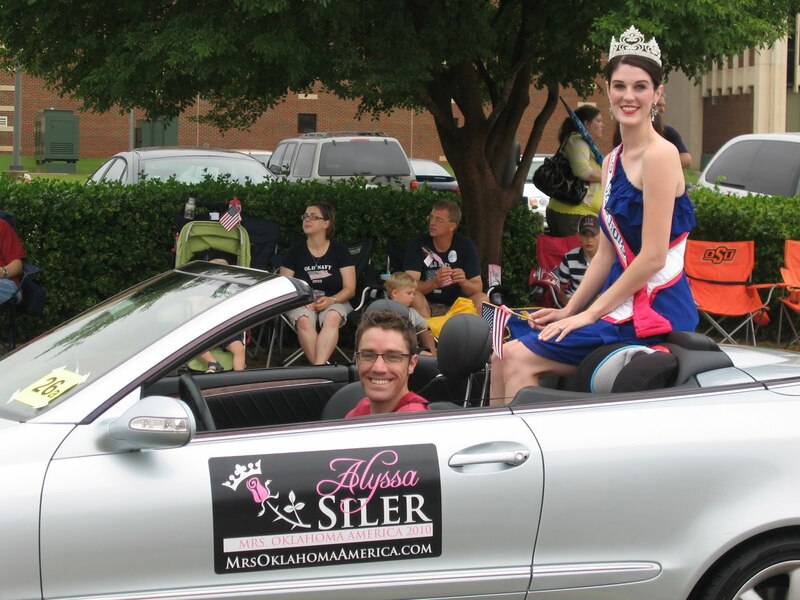 Edmond's Libertyfest, which takes place around the 4th of July each year, is ranked in the top 5 July 4th celebrations in the nation. There is a car show, a rodeo, and a kite festival. There's a fun children's event called Chalk It Up. One of the most popular events is called A Taste of Edmond. Different restaurants from across the city set up booths. You pay to get a wristband and then you can go around to all the different booths and eat as much as you want! 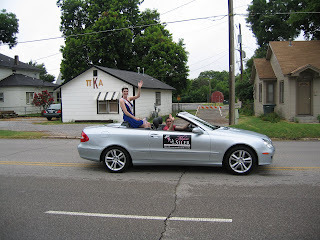 I took part in two different Libertyfest events. 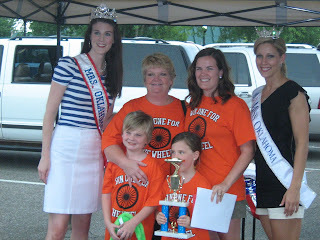 Last weekend I presented awards to the winners of the Road Rally, along with Emoly West, Miss Oklahoma 2010. The Road Rally is basically a big scavenger hunt on wheels. You have to follow clues and directions that take you all over the city. It is an event that my parents and I did for many years. 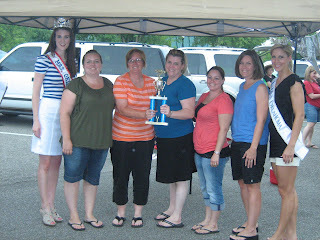 We took home one of the lovely car trophies many of those years! They give out an award for last place which is usually made into a joke. 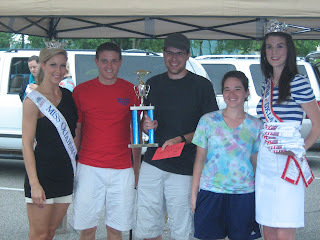 This year, however, everyone was very impressed with the last place winner. 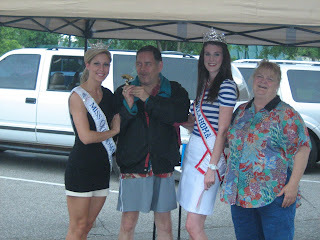 He was the contest's first ever blind/deaf participant. What an inspiration! 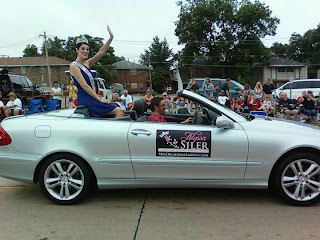 Today was Edmond's Libertyfest parade! Hayden went with my husband's parents to watch. 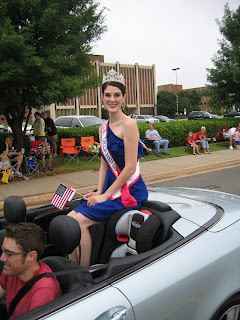 Here she is in her patriotic attire! Last night, I painted her finger and toe nails like American flags. She was oh-so excited! Hayden with my husband (and chauffeur for the day), Ryan WARNING: You are about to see some extreme pasty-ness. I've been trying to keep on at least a little self-tanner but I've been lazy this week. Hey, I'm of Irish descent. What can I say? Thanks to my sponsor, RAZR.com, for my wonderful car magnets! 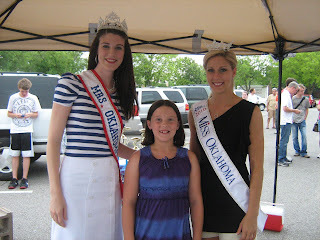 With Anna Marie Costello, Miss Oklahoma International With Emoly and Anna Marie With Julie Christian, Miss University of Central Oklahoma 2010. This was my title nine years ago. I did not at all feel old in this moment. My mom just recently bought this convertible. Great timing, mom! Now, come on. How cute is this guy!?! 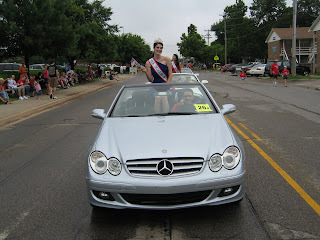 The parade was so much fun! There was an excellent crowd and my cheeks hurt from smiling so much. Tomorrow we will be taking Hayden to the big Parkfest activities and then to watch the fireworks. I can't wait. 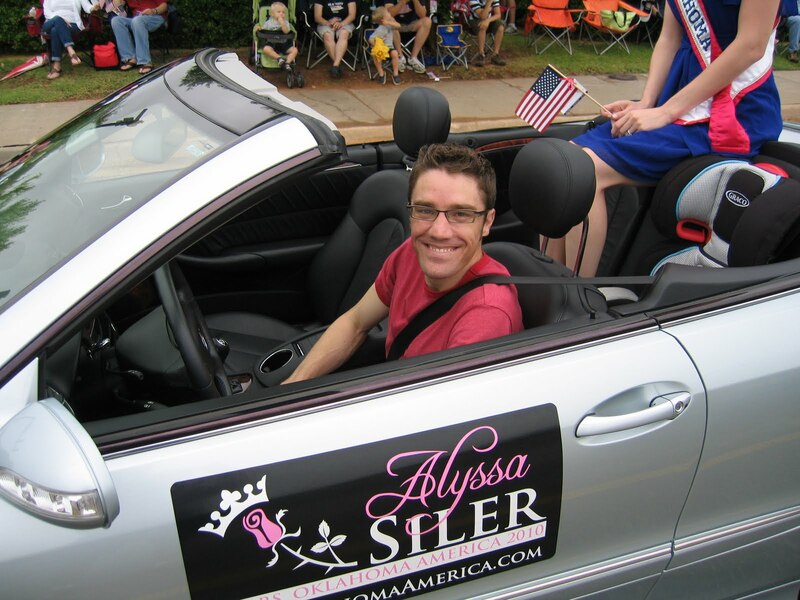 Why do you want to be Mrs. America? That was a question asked on my Mrs. America paperwork. Unfortunately, my answer could only be fifteen seconds in length because it will be recorded and possibly played the night of competition - if I make the top ten. While I'm content with my answer I gave, there is so much more I wanted to say. It's not that I expect all the judges will be web-surfing the contestant's blogs before the pageant, but let's just say they are.....What would I want them to read here that would give them better insight into why I want this title so badly - into why it means so much? I can't really describe to you what it's like to be told your child's life will probably be cut short. For me, it was a combination of numbness, disbelief, fear, desperation and many other feelings I can't put into words. 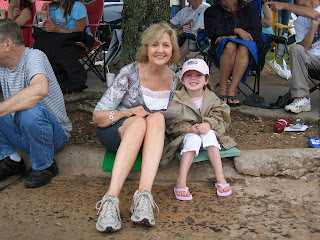 When my daughter was diagnosed with cystic fibrosis at birth, I didn't know what to do other than to hold her, rock her, love her, and pray - pray that God would heal her of the horrific disease that I was learning more and more about each day. When she was a couple of weeks old, however, something inside me shifted. I still wanted to pray and hold and rock - but there was a new desire inside me -a desire to fight. I made a decision that a life-expectancy of 36 was not ok with me. I made a decision that I was not going to let my daughter become a statistic. I made a decision that I was not going to be ruled by fear, but that, instead, I was going to get out and do whatever it took to change my daughter's fate. I threw myself into volunteer work for the Cystic Fibrosis Foundation, flying to Washington, D.C. for conferences, chairing our gala year after year, attending walks, all the while telling everyone I could about CF and what they could do to help. This past year, however, I came to a point where I felt I had gotten about as far as I could as "Hayden's mommy". I needed something more - a title that could get me into the public eye. That is how I was led to enter the Mrs. Oklahoma pageant. I need the job of Mrs. America. There are so many wonderful things I could do for my cause with the title. I have plans in my head for appearances on Ellen, The Today Show and Good Morning America. I have an entire hour planned for Oprah on orphan diseases with an emphasis on CF. I need to stand before Congress to fight for the Clinical Trials bill. Without it, many people have to choose between entering a trial or having health benefits. I need to encourage more people to become organ donors. Many people with CF are waiting for lung transplants and liver transplants. We have a boy in my local CF community waiting right now for the latter. Every two months when Hayden has a check up, I find myself holding my breath as the doctor feels her liver and checks her blood oxygen levels. Now matter how well she is doing now, I always have it in the back of my mind that it could be her someday - it could be her depending on an organ donation to live. There are so many things I could do with this title. Not for me, and not even just for my daughter, but for the entire CF community. I want to have an active role in saving my daughter's life. I want her to grow up and know that her mother did everything in her power to make a difference on her behalf. That is why I want to be Mrs. America.